Sean Kelly Gallery is delighted to announce an exhibition of new work by British artist, Julie Roberts. This is Roberts' third solo exhibition in New York. 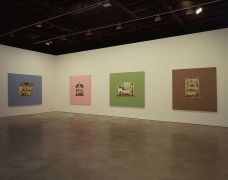 The exhibition includes works from 1999 to the present. At the entrance to the first gallery is a painting that depicts the actors who played the fictional crime solving duo Sherlock Holmes and Watson, whilst inside the gallery is a suite of 8 drawings of the female victims of Jack the Ripper, based on photographs taken by Scotland Yard. This juxtaposition of the fictional and the real continues in the second gallery with iconic paintings of famous art historical depictions of death scenes, including John Everett Millais' Ophelia, Henry Wallis' Chatterton and David's Marat. They are contrasted with portraits of artists and writers on their deathbeds; these include Jean Cocteau, Victor Hugo, Edvard Munch and Auguste Rodin. In the main gallery are four large paintings of doll's houses, which accurately represent specific British home interiors of four different decades. There are also two paintings of large dolls, one male, one female, and two paintings of chairs, Electric Chair and Chair Erotica, which add to Roberts' ongoing series of historical chairs as mediations on specific cultural milieu. Roberts' painting style viscerally focuses a stark contemporary gaze upon the frailties of the human condition, in which she strives to maximize the tension between attraction and repulsion, the real and perceived, abstraction and figuration. As Keith Hartley, Chief Curator and Deputy Director of the Scottish National Gallery of Art writes, "The themes that Roberts treats in her work, dream and reality, Eros and Thanatos, sleep and death, the mind and the body, the historical and the atemporal give her work a depth and associative richness that place her within a tradition going back to classical antiquity. More immediately, there is an affinity with the work of the Surrealists…in its love of ambiguity and the darker side, always tempered by a belief in the positive power of Eros." Roberts is widely exhibited internationally and has been included in the Aperto‚ section of the Venice Biennale, Italy in 1993, and in recent exhibitions in the Musée d'Art Moderne de la Ville de Paris, Paris; the Museum Ludwig, Budapest; the Scottish National Gallery, Edinburgh; the Hayward Gallery, London; Tate St Ives, England; the Kunsthalle Mannheim, Germany and the Moderna Museet, Umeå, Sweden. In 1995 Roberts was the first recipient of the Scottish Arts Council's Scholarship at the British School in Rome, Italy. Roberts is represented in numerous public and private collections worldwide including The Hirshhorn Museum, Washington, DC; Indianapolis Art Museum, Indiana; the Tate Gallery, London; The Scottish National Gallery of Modern Art, Edinburgh; The National Museums and Galleries of Wales, Cardiff; Centre National des Arts Plastiques, Paris; the Moderna Museet, Stockholm and Serralves Museum of Contemporary Art, Oporto, Portugal. 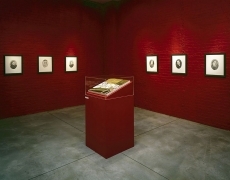 To coincide with this exhibition, the gallery is publishing a major monograph on Roberts' work, entitled Home: Works by Julie Roberts 1993 - 2003 with essays by Keith Hartley, Chief Curator and Deputy Director of the Scottish National Gallery of Art, Edinburgh, and William Clark, a writer and independent curator living in Glasgow, Scotland.